In 1964, Austria hosted its first Horticultural Expo – the Wiener Internationale Gartenschau (WIG) 1964. 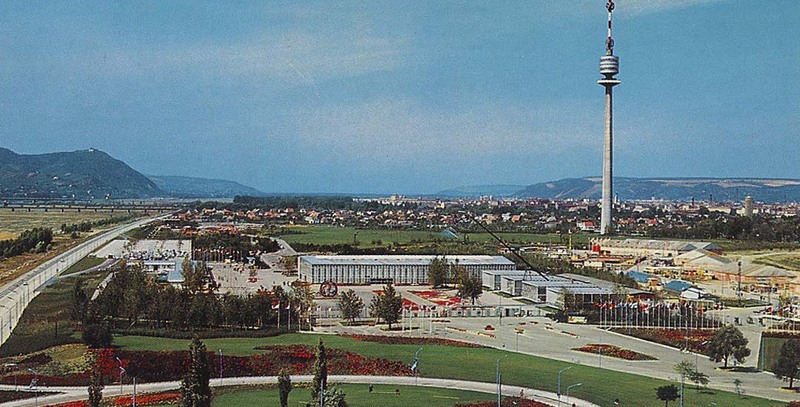 Recognised by the General Assembly of the BIE on 13 November 1962, the Expo formed part of Vienna’s post-war urban development strategy, and was inspired by similar horticultural exhibitions in Germany that aimed to create or re-establish urban green spaces. The selected site for the Expo was a “problem zone” between the Danube and the Old Danube (Alte Danau) that was previously used as a landfill, a shooting range, and a former slum. In its place, the Donaupark was created, with the improvement of Vienna’s image considered a priority for Organisers and particularly the mayor of Vienna, Franz Jonas, who sought a counterweight to increasing traffic and urbanisation. At the centre of the 100ha site, the Hannes Lintl-designed Donauturm (Danube Tower) was built, which at 252-metres instantly becoming a key feature on Vienna’ skyline. Alfred Auer, Director of Vienna’s Parks and Gardens, was given the responsibility of designing the site and its gardens, with a focus on the contemporary need for stress-free recreational areas in the city. Surrounding the Donauturm, the 180,000m2 “lawn bowl” and the newly-created 30,000m2 Iris Lake were created, beyond which were located the national gardens and theme areas, including a rosarium, a lily garden, a Paracelsus herb garden, and a moorland garden. Visitors could learn about different aspects of horticulture in the thematic pavilions, which were devoted to exhibitions on plant protection, fertilisation, forestry, the home and garden, fruit and vegetable processing, and research. Additionally, the 41-metre Ruthnerturm greenhouse, which fertilised and irrigated plants using an automated lift system, was one of the technological marvels at the Expo, and is considered a pioneer of vertical farming. A total of 29 countries participated in the Expo, of which 12 designed their own national garden. Some of the most notable international landscape architects contributed to the international section, including Roberto Burle Marx for Brazil, Hermann Thiele for Germany, and Willi Neukom for Switzerland. For visitors, the experience went beyond the horticultural exhibits and gardens; cultural events were held throughout the Expo, including open-air exhibitions and artistic performances on the Iris Lake. Moving around the site was facilitated by a miniature railway, as well as a 2.2km double chairlift which allowed visitors to appreciate a full view of the site. The best views, however, were from the top of the Donauturm, which featured a rotating restaurant. After gathering over 2 million visitors during the Expo, the site became a new public park for Vienna. Retaining many of its original features with the Donauturm, the miniature railway, and the rosarium, the park is one of the largest and most popular green spaces in the city. In 2014, the Wien Museum celebrated the 50th anniversary of the Expo with a dedicated exhibition paying tribute to the importance of WIG 1964 in the development of modern Vienna.